Dear Donald Trump. 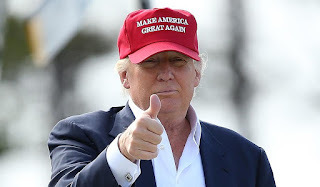 You are a great president. Probably one of the greatest this country has ever seen. You have the best mind for it, and the fake news media just don't give you enough credit, which I think is really sad. But we are many, probably more than anybody realizes, that admire you and your accomplishments. You are doing a really great job, so keep up the good work. I have never been of any other opinion about your candidacy and presidency, and if anyone says otherwise, they're lying. Trust me, as I trust you in everything. I trust your judgment on political issues, and of course in all things business – the country should be run like a business. Here are a few things that I think if you fixed, as only you can, sooner rather than later, it would only further strengthen your reputation. 1) We both know that renewable energy is here to stay, and that it can employ a boatload of Americans. Show these idiots who don't believe in you that you are the man to get this really going. You'd be rightfully remembered as the greatest president if you were the one to solve this problem. All you have to do is divert funds into this sector, and jobs will spring up everywhere. 2) Your political base consists of both the common worker – coal miners, factory workers, service people, you know, the real America – as well as Wall Street bankers, also known as the people who really run the country. Both have to be heard. But you already know what they both need, which is jobs, tax-cuts, and freedom to do whatever business they want. And we'll get there, in time. You just have to lay the foundation, which counter-intuitively (only the smartest people like you really understand this) means to regulate Wall Street for the time being, and create jobs in renewable energy, infrastructure, etc. 3) Health-care: You ran on a promise to get everyone covered. And we know this is possible – every other developed country has done it. The challenge is to make it greater in America than anywhere else. I believe, I know, that you are the right person to do it. No one else can. Imagine the money American companies would save if they didn't have to pay for their employees health care. Business would be booming! And you'd get all the credit for it. No one but Trump would smart enough to do this for American businesses. The increase in taxes would be nothing compared to what every person – your voters in particular – would benefit from access to universal health-care. We'll call it TrumpCare, and your legacy would be safe in perpetuity. Means forever. 4) The military. The great news is that so much money could be saved by cutting down on military spending. America is already the greatest country in the world, spending more than all other nations combined on our military. But you are smart, and I know you are aware that lots of money are not spent in smart ways within the military. We can do better, we can be the strongest, and yet do it for less money (that can then be spent on creating jobs here at home) if we are smart about it. And no one is better suited to do this than you, which you have proven again and again. Keep it going! That's just a few of the big ones. Just imagine the legacy you would leave behind if you quickly fixed just these few things. People big and small would praise you to the skies, and the people who didn't believe in you – like I always have – would be proven wrong yet again. Except this time they would have to admit that you are making American great again, as only a great man like yourself can. When scientists give talks/seminars/colloquia/presentations/speeches/lectures/lessons/defenses/instructions, questions are welcomed, and (probably to give themselves time to think), they often start by stating that that is a good question. 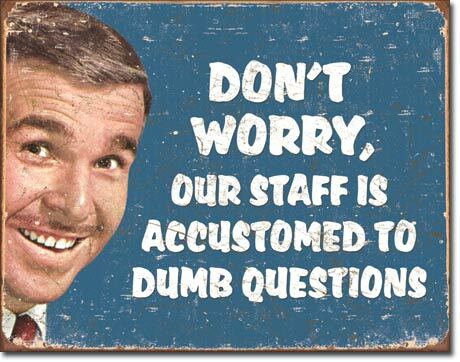 What they don't do is designate a question as dumb or stupid, because that's offensive, and scientists are frail like quails when it comes to their intellects. I have thought about that before, but I haven't come up with an answer, and here's why. I have thought about that before, and here's the answer. I have already explained that, but I'm happy to go over it again. The answer is obvious, and I'm surprised you don't know it. I welcome all of these myself, but there are also questions that can be designated "mean", which I enjoy less. For example, when the person asking already knows the question and is just quizzing you (acceptable at a defense/exam). Or when asked in order to bolster oneself showing off how much they know, or to turn the discussion in a certain direction (the aging Prof's pet area of study, typically), which is mean to the extent that it takes the focus off the speaker and the subject matter. Scientists, especially graduate students, are very afraid of asking dumb questions, but they shouldn't be. First of all, if you ask one of the two kinds of dumb questions listed here, know that if you didn't get it, most likely you're not alone, and your peers will be grateful that you asked the question. On top of that, the speaker will often realize that maybe they shouldn't have assumed that everyone knew the answer, and should have been more careful explaining it in the first place. But also, I have found that learning to embrace what might by some be seen as a stupid question crucially paves the way to understanding. The road to failure is paved with unasked questions, or something like that. "You pay more than enough for college. A fortune, to be explicit. Or someone does. Either way, it's obscene. But then, I promise you to give this shot everything I've got. I want you to learn. I will do what I can. I want you to tell me how I can. I am at your disposal. Do not forget this. I will not mock you, I will not overlook you. I will take you seriously at all times, even if I involuntarily crack a joke. Not that it's always involuntary. But my promise is that you can freely and openly ask your question and state your opinion without the fear of ridicule, from me or from your peers. In here, no such ridicule is welcome, and only admiration is given in return for asking questions. Questions, which you never alone have. Chances are others do too. And in the rare cases where this is not true, you are a genius." Please help me with a little science experiment. Measure your Step Acuity (SA) and report it here. Your SA is the number of steps before you hit a mark that you know whether you will hit the mark with your right or left foot. As you are walking down the street, choose a mark (a line or a spot) on the ground far in front of you, and say "right" or "left" out loud the moment you realize which foot is going to step on the mark, and from there count 1, 2, 3... until you hit the mark. Do you have an SA (i.e., mostly the same outcome every time), or is the number of steps highly variable? No cheating, this is not a competition. Just honestly report back, SVP. The hypothesis is that everyone has an SA, meaning the number of steps is highly invariable, and that SA is normally distributed. H2: The SA is different between those who played football (soccer) as a child and those who did not. Also, feel free to report how many steps before hitting the mark you know that you are not hitting it at all (i.e., it's right in between left and right foot). Have fun. The Ivory Tower is not my friend. We will not sit idle and look down at the masses while society goes to hell. Science is to be shared, and that's why we do it. There is no such thing as "their terms". We bring our terms to the table always, and this is how we move forward. When someone attacks, we defend ourselves. We won't just let them walk into our living room and destroy everything. Religion leads to creationism. Nothing else does. Creationism thus implies religion. If you're still in doubt what the real problem here is, then you're part of the problem. This is a war that will take a long time, but we know who will win it. We will not stand idle by and be on the wrong side of history. We will use any and every opportunity to share science with the public. The evidence can take us where it wants. We shall have no baggage that will make us resist it. On some topics there is no legitimate scientific debate, but we will not be afraid of debating science-deniers on these topics, even though the public may perceive that as an acknowledgement that a legitimate debate exists. Stating that there is no debate is a case of Expert Blindness. Just because you have resolved the issue doesn't mean everyone else has. We will share our expert knowledge with everyone. One could very well say the same thing about the weather: a hundred years ago, no one in their right mind (which is a tricky way of denoting all but the ones with the most foresight) would have guessed that we would ever be able to accurately predict the weather ten days into the future. But incredible advances in physics now allows us to do just that. Even though the weather systems are very sensitive to many factors, with the combination of the Navier-Stokes equations and a continuous effort to measure weather all over the world, we are now comfortable trusting that the weather forecasts are more accurate than guessing. In this article by Carl Zimmer from 2014 several researchers explain how the same type of forecasting could potentially be applied to evolutionary biology. Particularly, it is not at all inconceivable that we will be able to predict flu virus evolution, thereby better making vaccines and saving lives. Microbial evolution, it turns out, often has much more repeatable outcomes than what is traditionally thought. Recent research strongly suggest that this is the case, for example when bacteria evolve the same solutions again and again to the same problems. One way to think of evolutionary forecasting is by obtaining as much data as possible about the fitness of genetic variants. If we know which variants (bacteria and viruses are the best candidate organisms) are most successful in making copies of themselves, then we can potentially make predictions of how they will evolve in the near future - just like with the weather. The problem is that measuring fitness for many many genetic variants is still difficult. It means sequencing many individual organisms, and it means measuring fitness for each one of those variants. 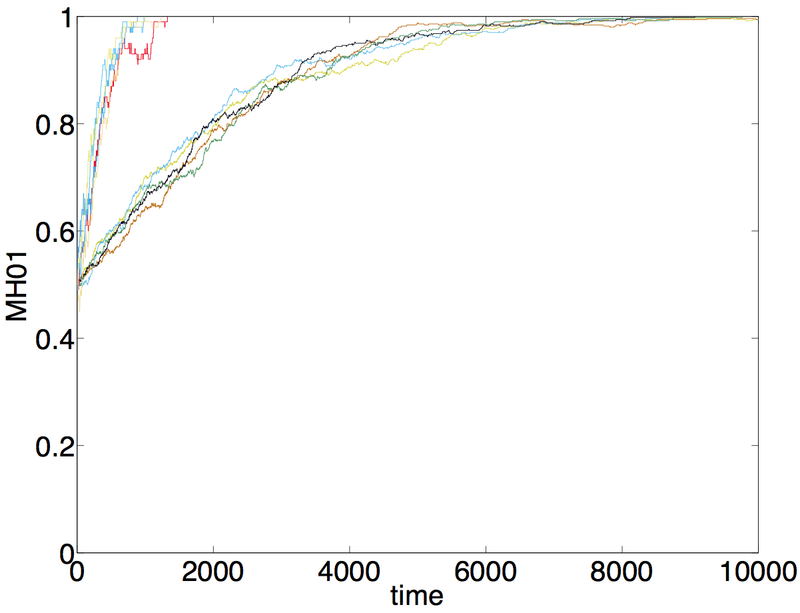 The resulting fitness landscape (i.e., fitness as a function of the genotype) is the last of three parameters needed to predict the simplest evolutionary systems. The other two are the population size and the mutation rate. Both of these are fortunately much easier to measure than the fitness landscape. So the fitness landscape remains the biggest obstacle. But it has only taken a few years to get quite far with measurements, and I don’t think it is at all inconceivable that we could have evolutionary forecasts for certain viruses and bacteria within the next few decades. Returning to Gould, I predict that his lasting impact on evolutionary biology will be similar to Lamarck's: His "rewinding the tape of life" will be the quintessential error that people will keep referring to when talking about evolutionary forecasting. Do you really believe that if we reran the tape of life we would always end up with a continent like Australia where marsupials outnumber placental mammals? Do you believe that every possible scenario would result in hundreds of species of dinosaurs that go extinct about 65 million years ago? Is the great Permian extinction always going to happen? Will an oxygen evolving complex always arise in primitive cyanobacterium about 2.5 billion years ago? Are you convinced that replaying the tape of life will always produce eukaryotes with introns and complex spliceosomes? Will no replay ever produce highly intelligent New World Monkeys? Are poisonous mushrooms absolutely necessary? Will the platypus always evolve and never go extinct? If we ever find another planet that's very similar to Earth do you expect to find intelligent mammals and maple trees? Gould will be remembered for his attack on adaptationism and reminding us that there's more to evolution than natural selection. He will be remembered for teaching us about contingency and exaptation. He will be remembered for hierarchical theory. Above all, he will be remembered for making us all aware of the fact that evolution is a lot more complicated than we think. One objection to the tape metaphor is that it is not well-defined. Does "rewinding the tape of life" mean that everything starts out the same? The initial conditions are *exactly* the same? What about the random events that influence evolution, will they be exactly the same or are they different? Are we talking about the environmental effects (weather, plate tectonics, ET events) being the same or not? Would mutations be identical or just drawn from the same distribution? 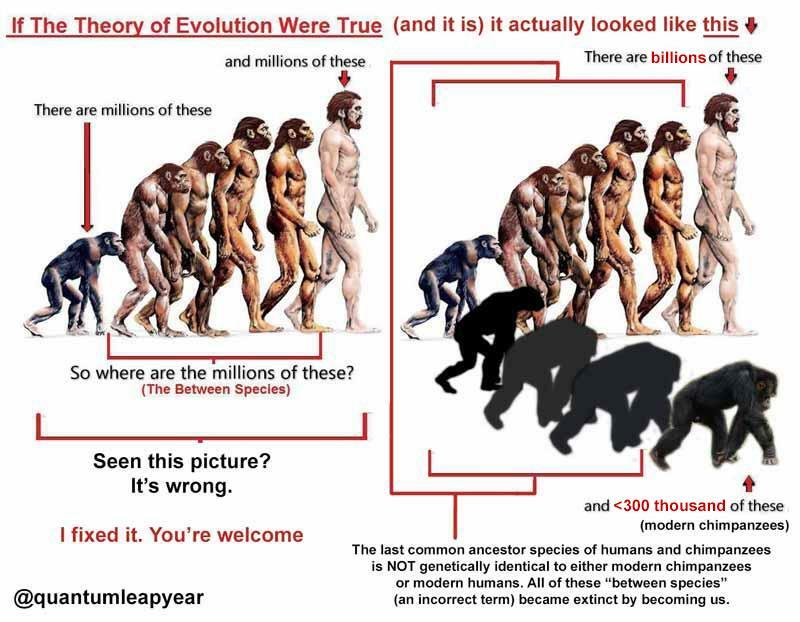 Some people may have a clear idea of these things and thus feel confident of what the metaphor really means, but I know for a fact that there is not a general consensus about this, with several evolutionary biologists that I have talked to having differing views about its interpretation. We can all agree that randomness is very important in evolution, but not what kind of randomness is part of the metaphor. In answer to Larry's questions above, one answer is no, not that specifically. Stochasticity (randomness) is too strong a factor, and future evolutionary events are contingent on earlier events. On the other hand, it may be that stochasticity doesn't mean that evolution is unpredictable, just like it is not unpredictable what will happen when you heat a pot of water, even though we can't predict the path of every individual water molecule. On the first hand again, if we're talking about, say, evolution on other planets, then no, we cannot expect those exact outcomes. However, Gould also denied that humans would be a repeat outcome if the tape was rewinded, but it is not clearly defined what we mean by "humans" in this context. If by humans we mean intelligent bipedal tetrapods with a head on top, then I do think there are very good reasons to believe that such creatures could evolve again and again, and be a feature on many planets that harbor life throughout the universe. Back on the second hand, one can argue that every event that ever happens is determined by previous physical states. Things are only as random as we are unable to foresee the next event. A random mutation is only random because we don't know the factors that determine it, or because we don't have the data to predict it. In other words, if we rewind until some time point, everything else is the same up until that time point, so there are good reasons to believe that all future random events would be identical to the first run, and we would thus get exactly what we got the first time. Payam Rowghanian (bass) and Bjørn Østman (piano/guitar/vocals) performing live on September 10, 2016. No fun intended. Does the hero die a hero, or does she survive? 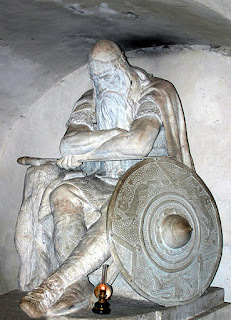 In our worship of the mortal champion for good, is it imperative that the hero dies in the act, or do we need her to live? What is this uniquely human construct of the hero? Why is it important for us to imagine the hero? Is the individual savior, or even a succession of hero individuals, the true constituent that will save us? Or is it that a higher-level entity comprised of individual humans is the real savior, and that the individual only takes credit because that is the only way our evolved conscious is capable of telling the story? Does the fact that the onus of our past evolution was the individual cause us to only be able to think of heroes as individuals? Can we elevate our understanding of evolution and the narrative of the struggle to encompass the larger community comprised of individuals? Rationally and evidently we know that the larger community - that which is larger than the individual tribe and consisting of more members than each individual can keep track of - is the entity effecting real and lasting change. The mark of the hero is self-sacrifice for the common good, but it is for the sake of, and brought about by, the community and the common good. Where we aim our admiration and how we tell the story is a product of our evolved way of thinking, but it is also a way of thinking that we have evolved a capacity for elevating, and we now have the resources and the knowledge to make this transition. Hero has a meaning, and only needlessly do we need to change it. But perhaps we need another term to properly tell the tale of the hero-community? The individual hero eventually dies, whether in the heroic act or not, but both the true originator and the benefactor - the community - survives. Holger Danske rises up against the invading forces, but is personified not by a single individual but as a group. 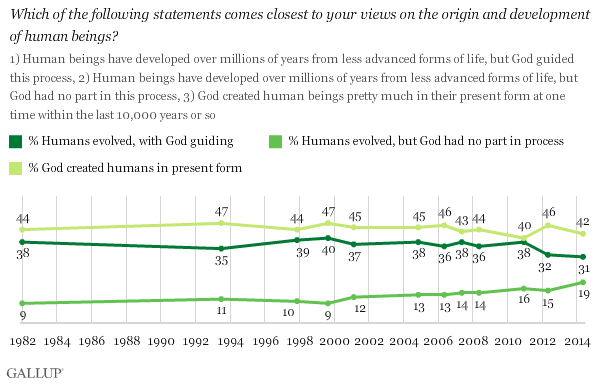 Will the creationists accept this gambit? Rejoice in the fact that unicorns (as predicted in the Bible) actually existed, but agreeing to the Earth being at least 29,000 years old? Original image made by reddit user arthurpaliden. This version by Twitter user @quantumleapyear. Important update 7/21-15: Please see comments below on the really low quality of the data. I was originally serious about this analysis taking the IQ data at face value, but now want to state that while I do find the aspect of the flag colors amusing, I totally do not trust the IQ data. If your country has green in its flag, then you are less likely to be intelligent. If that isn't an explosive statement, then I don't know what is. But data from Raven-online suggest that this is true. The average IQ of countries with green flags is 79.2 (stdev=9.5) and of countries no no green it is 89.0 (stdev=10.1), and this difference is statistically significant (a 2-sample t-test gives p=2.29e-10). You can download the annotated data here. It has been demonstrated that there is a 70% correlation between the results of this test and educational achievement. Consequently, the higher your result in this test the greater your chances of success at higher levels of study. By comparison, the correlation factors in other IQ tests have an average variation of between 20 and 60%. 70% is a very strong correlation, and they are probably right to point out that the strong correlation between IQ and level of education is not spurious. And yet, I think they got causality the wrong way around. They are implying that if you have high IQ, then you have a higher the chance that you can successfully attain a higher educational degree. But look at the top ranked countries: Italy has some green in their flag and an average IQ score of 102. The countries ranked higher than Italy are Hong Kong, Singapore, South Korea, Japan, and Taiwan - all affluent Asian nations that emphasize book-studies from a very young age. Many, if not all, of these countries make middle-schoolers take tests, and these tests matter for their future. They are, in other words, trained to take tests. Their school systems are good at making students do well on tests. Compare that to poor counties like Djibouti, Lesotho, Gabon, and Equatorial Guinea, who all have green in their flags. They are poor countries, which obviously negatively affects education, which then doesn't allow children to practice taking tests very much (which I am not particularly in favor of anyway, I have to say). You can practice taking tests, and it will affect your score. If that wasn't true, then there would be no point in practicing taking tests, which is something teachers everywhere make their students do. have in life, the higher your IQ is likely to be. The really interesting question here is what causes the correlation between average national IQ and having green in the flag. You could very well argue that it's completely spurious: just because there isa correlation does not necessitate that there is any causation. It is difficult to argue against such a proposition - there exists lots of very intriguing but probably completely random correlations, such as yearly deaths by drowning in a pool vs. the number of movies Nicholas Cage has appeared in. However, those strange and unexplainable correlations are found by cherry-picking many, many more random pairs of variables. 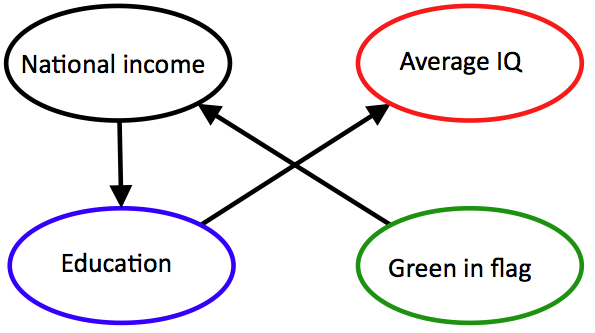 The correlation between IQ and green in flag is a one-shot observation, which makes it stand out. The task is then to come up with plausible explanations for the relationship. Other variables could be introduced. It seems to me that the "green" countries are for the most part warmer countries, particularly African. The closer countries are to the equator (lower latitude), the worse the average IQ is. 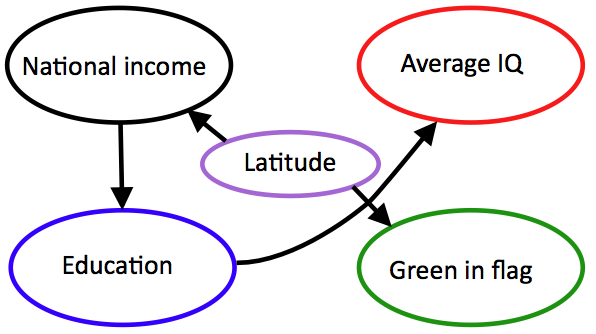 Perhaps something about the latitude causes lower national income (Jared Diamond argue that coincidental geography is the main factor in explaining differences in national wealth among countries) and a preference for green? How about this: "people who live in environments where plants are green all year round are more likely to make their flags contain some green". It could be some other psychological preference that is shaped by living at a lower latitude. I am stumped. Maybe some historian would have something to say about the prevalence of green flags at lower latitudes? I ask again: do differences in average national IQ scores contribute to national wealth and economic growth, or is is more likely that national wealth contribute to raising the national average IQ? I'd say the latter, contrary to Richard and Tatu. However, there's probably little doubt that having an educated population does contributes to the national wealth, so causality is likely circular: wealth → education → wealth, with higher average IQ (i.e., test-taking abilities) as a side-effect. Ken Ham (founder and president of Answers in Genesis, the Creation Museum, wannabe arc builder) is a Young Earth creationist, and he prides himself in taking everything in the Bible literally. AiG even says that they don't interpret the Bible, they "just read it", which is of course a load of hogwash, as everything is written interpreted in some way (for example from other languages to English!). I agree with him on two points, but then I think that's it: that it makes no sense to pick and choose which parts of the Bible to take literally, and that he is entitled to his beliefs. How can we know which parts of the Bible are allegory and which stories really happened? I think we can't. Ham's and my solution are just completely opposite, as I choose to believe that everything in the Bible is written by man. And on the latter agreement, he can believe what he wants. I just wish he would keep it to himself, because I think his beliefs are really bad for society. I don't object to his beliefs merely because I can. I don't bash him and AiG just because I have a right to do so, but because they are demonstratively making things worse for us all. Creationism, global climate change denial, anti-science, anti-rationality, anti-education, etc. 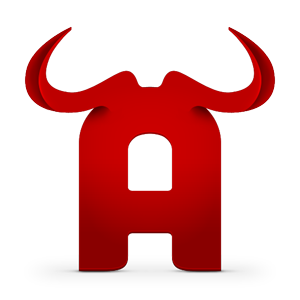 I write this because many people, Christians and atheists alike, are accomodationists. They believe there need not be a conflict between religion and science. They often point to prominent scientists who are/were religious (Francis Collins, Kenneth Miller, Isaac Newton, etc.). But that these people manage(d) to reconcile their faith with scientific facts doesn't mean that it is a logically consistent position. They have merely succeeded in compartmentalizing these two spheres of knowledge so they don't overlap. How long does it take to lose a culture, from a Christian perspective? Actually, it takes only one generation. Nice one, Ken! Quoting Hitler right in the beginning. Really?! That's one of the saddest passages in the Bible? How about the flood, when most humans and animals perished? What about when the LORD sent two bears to maul 42 kids? But yes, I understand his sadness nonetheless. Ken is sad because children today are leaving the church, and that is all he really cares about. Obviously the parents in Joshua’s day did not teach their children as they should have—and in one generation, the devil had those kids! While it’s ultimately a matter of God’s grace that anyone is saved, God has given parents an immense responsibility to do their part. Over and over again, the Jewish fathers were told about their crucial role but they shirked it (see Psalm 78). Here is the eternal dichotomy that is such a huge problem for Christianity, but which is always ignored: if God is omnipotent, why does he need our help? Why doesn't he just make it so? If he gives us free will, how can he know everything? And why did he need to torture his own son in order to forgive us for our sins? Why doesn't he just forgive us like normal people forgive each other without the barbary? The answer is of course that those stories were made up by frightened humans, and it is not a compelling story to just have God forgive us all and make everything nice and rosy. The public schools have been teaching their own brand of apologetics: how to defend the idea of evolution and history over millions of years, thus causing multitudes of U.S. students from Christian homes to doubt the history in Genesis. Doubts about Genesis place young people on a slippery slide of unbelief that eventually destroys their confidence in the rest of Scripture. Their trust in the soul-saving gospel itself, which is grounded on the Bible’s historical claims, is undermined. Completely true. I think that is exactly how it works. Education and information is what will erode creationist beliefs, because while religion does not imply creationism, creationism does imply religion. Creationism come only from religion. The accomodationist view is a fallacious one, and the inevitable result is that more and more new adults will realize how problematic it is to reconcile the actual contradictions between scripture and scientific facts, as well as the contradictory ways of understanding the world around us, one being based on evidence and the other on faith (i.e., arbitrary beliefs contrary to evidence). Yes, the atheists, like Hitler and Stalin, know that if they can capture the next generation (through the education system, media, etc. ), they will have the culture. Hitler was Catholic. And yes, the culture will be shaped by the coming generations, of course. We all know this, and there is nothing nefarious about wanting to educate our children the best way possible. 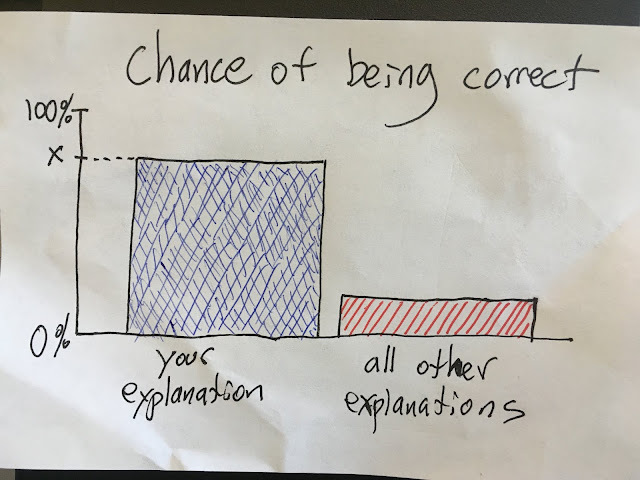 Science in science classes. Religion in history(?) classes. All of the religions. Go teach your sheep whatever you want in your own churches, but keep church and state separate in the public sphere. Also, tax the churches. So what is Ken Ham's solution? Teaching young people how God’s Word—rather than the atheistic worldview—makes sense of our world requires intense study, commitment, and fervent prayer on our parts. The church and parents must reevaluate their old assumptions about the way we should be teaching our kids in a hostile culture, and work together to build the next generation by following the directives from God’s Word. Imagine what would happen if God’s people raised up generations of kids who knew what they believed concerning the Christian faith, why they believe, and how to defend that faith against the secular attacks of the day. They could then proclaim the gospel with authority because they believed the authority upon which it stands. We would change the world! In other words, shield your children from the evil ways of the secular humanists. Teach your kids apologetics. I am pleased to see that Ken Ham really has no new answer to his problem. I'll give him one, though: remove the First Amendment, teach only the one true religion in public schools, shut down the internet, build a theocracy. That will really make your problem go away, because the next generations would then be ignorant of how the world actually works. Move to Saudi Arabia, Ken. Fig 2. Percentage of American adolescents endorsing “none” for religious affiliation, 1966–2014. From Twenge et al. (2015) Generational and Time Period Differences in American Adolescents’ Religious Orientation, 1966–2014, PLoS ONE. The Monty Hall problem is very famous (Wikipedia, NYT). It is so famous because it so easily fools almost everyone the first time they hear about it, including people with doctorate degrees in various STEM fields. There are three doors. Behind one is a big prize, a car, and behind the two others are goats. The contestant first picks one door without opening it. Then the game show host tells you that he will open one of the other two doors behind which there is a goat. It is assumed (but often untold) that the host knows where the car is, and so deliberately opens a door with a goat behind it. It is also assumed that the contestant wants to win the car, but let me tell you already that if you really want a goat, you can be sure to get one. Then the contestant is given the choice of choosing again. Since there are now two closed doors, the choices are to stay on the door first chosen or to switch to the only other closed door. The question is what the best strategy is, switching or staying. Is the probability of getting the car 50% for staying and switching? No, it turns out that switching is the best strategy, giving the contestant a 2 in 3 chance of winning the car. Why? Well, there are many ways to realize this. My favorite is this. Once the contestant has chosen one door, we know that the chance the car is behind it is 1/3. Thus, the chance it’s behind one of the two others is 2/3. Because the host opens one of the two other doors, switching is equivalent to actually choosing two doors, giving a 2 in 3 chance of getting the car. There we go. Another way to arrive at this (correct) result is to actually do it many times over. Pick three cards, a red (the car) and two black (the goats), and have someone play the host. Do this say 100 times, and you’ll se that if you switch every time, you’l get in the neighborhood of 67 red car(d)s. However, I give it a pretty good chance that if you do this, then after playing a handful of times you’ll anyway realize that the solution of course is 2/3 for switching. I once many years ago set out to write a code to do the experiment. I would write the code, run it a kadoolian times and expect to see the switching strategy win out two thirds of a kadoolian times. However, much to my surprise, when I started writing the code, if-statements and all, the solution became so glaringly obvious that I gave up doing it. It just seemed so futile at that point. 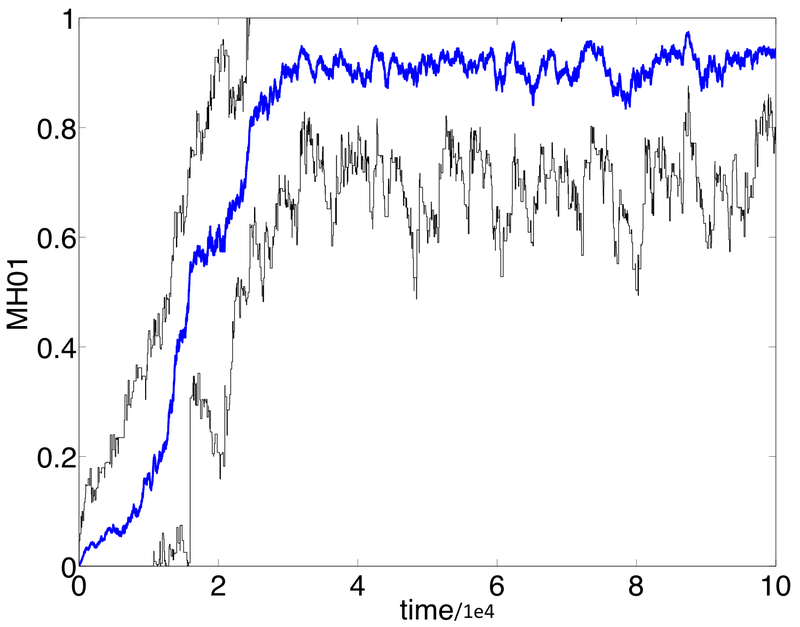 I suspect that my hankering for using simulations to investigate problems was strongly influenced by this experience. Recently I have introduced several people to the Monty Hall problem - always a great party trick. And again, almost everyone instantly arrives at 50/50, and are as adamant that this is the correct solution as the next guy. So I decided to finally write the code to do it, but made two stipulations: 1) the code must mirror the way the problem is told as closely as possible. This will not be the most efficient code to write or the fastest to execute, but will hopefully be easy for readers to see through, so to speak. And 2) rather than just playing the game many times, I will let a population of individuals play it and compete with each other for a chance to reproduce (aka evolution). For full disclosure, the code is included below. The objective of the organisms is to come up with the best strategy for playing the Monty Hall game. Each organisms has just one “gene”, called MH01, and this gene determines the probability that when playing the game the organism chooses to stay or to switch. The value of MH01 is a number between 0 and 1. If the number is 0, the organism never switches door, and if it is 1, then the organism always switches, and if the value is, say, 0.4825, then there is a 48.25 percent chance that the organism switches door. Easy-peasy. We do two experiments: 1) comparing two strategies (50% switching vs. 50% staying, or MH01=0 vs. MH01 = 1) without mutations, and 2) starting all individuals with MH01=0 and adding mutations to all offspring. We start with a population of N=100 individual organisms. 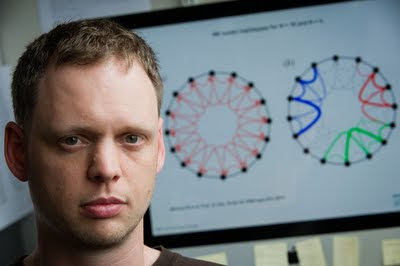 One organism is chosen at random among the N individuals to play the game. If it wins it gets to reproduce. In that case a copy of it now replaces one of the N organisms chosen at random (including its parent). Nothing happens if they lose the game. This results in a constant population size and overlapping generations. When an offspring replaces a hapless individual, the MH01 gene can mutate (in experiment 2). 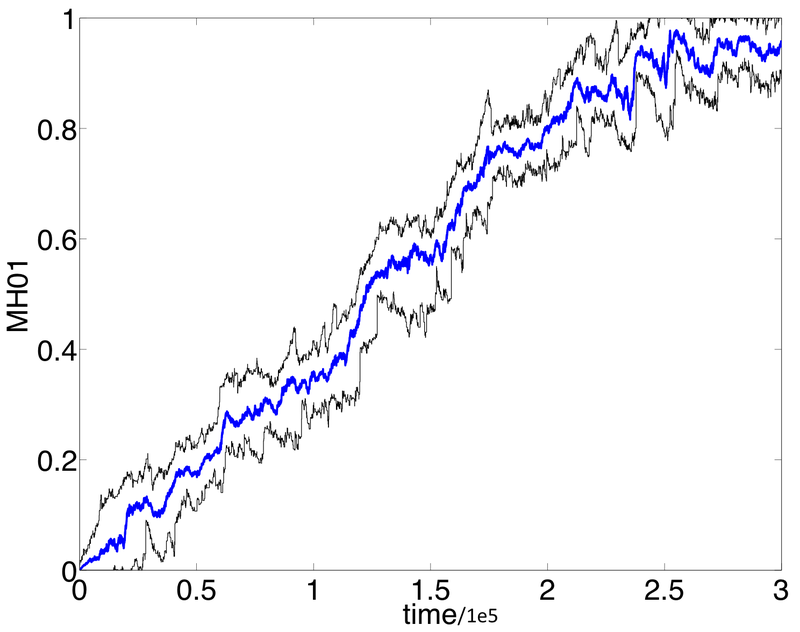 This results in MH01 increasing or decreasing by a small uniformly random value. And that’s it. Figure 1: Starting with 50% switchers (MH01=1) and 50% stayers (MH01=0) all ten simulation runs result in the switchers outcompeting the stayers. Switchers win the Monty Hall game twice as often, and the population frequency of MH01=1 thus stochastically increases until it reaches 100% (fixation). Population size is N=100 (the five runs that reach a frequency of 1 after about 1,000 plays) and N=500 (five runs that take about 10,000 plays to go to fixation). Figure 2: Average population value of MH01 with large-effect mutations. Starting with 100% stayers (MH0=0). MH01 increases relatively fast, reaching the largest value after around 30,000 plays. The effect of mutations is uniformly distributed on the interval ±0.05 centered on the current value. Population size is N=100. The black lines are minimum (bottom) and maximum (top) values of MH01 in the population. Figure 3: Average population value of MH01 with small-effect mutations. Starting with 100% stayers (MH0=0). MH01 increases relatively slowly, reaching the largest value after around 250,000 plays. The effect of mutations is uniformly distributed on the interval ±0.01 centered on the current value. Population size is N=100. The black lines are minimum (bottom) and maximum (top) values of MH01 in the population. There is less variation in MH01 in this case because the effect of mutations is lower than in the runs shown in figure 2. What a relief! When running simulations like this there is always the risk that for some unseen reason the evolved solution is different from what you anticipated. Thankfully that is not the case here: evolution favors the fittest organisms, and the fittest organisms are those that tend to switch when they play the game. Success! Why does MH01 not go to fixation? In other words, why does the average population value of MH01 (blue lines) not become 1? The answer is that there is a mutational load (Wikipedia) caused by the effect of mutations. Offspring of a parent with MH01=1 has a 50% chance of having a lower value of MH01, so there will always be some individuals with a suboptimal value of MH01. What is increased in evolutionary dynamics is not fitness but free fitness. Free fitness is the sum of the logarithm of fitness and an entropy term that is non-zero when there is either mutation and/or drift. The term was introduced by Yoh Iwasa in 1988: Free fitness that always increases in evolution. Let me reiterate that the answer of 2/3 chance to get the car when switching relies on the game host knowing where the car is, and deliberately opening a door that the contestant has not chosen and where there is a goat behind. 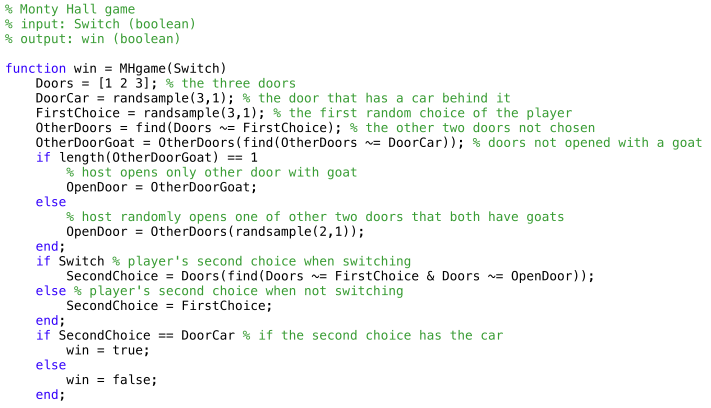 If the host opens another door at random and there happens to be a goat behind it, then the probability of getting the car is only 50% for switching (and for staying). The probability is thus dependent on the knowledge that the contestant has about the knowledge and intent of the host. Only if the contestant knows that the host knows what he is doing does the chance increase by switching. Update 7/15/2015: I was wrong about the effect of the knowledge of the contestant about what the host knows. It makes no difference what the contestant knows about what the host knows. If the host knows what he is doing, then the chance of winning by switching is 2/3 no matter what. Otherwise this simulation would not work, as the computer doesn't "know" anything. A simple enumeration of the possible outcomes makes this abundantly clear, as seen below in the comments. You can play the Monty Hall game here, where you can also play the version where the host does not know which door has the car. Answer is Genesis (i.e., Ken Ham and the Creation Museum) has published a really nice description of the bedbug paper that came out earlier this year. The story is in short that bedbugs used to be one species feeding on bat blood, but now they are in the process of splitting into two species, with one specializing on humans. This has been going on for quite a while, but evolution is - mostly - a slow process, so have a little patience, yeah? Genetic analysis supports the hypothesis that today’s common bedbug originated in bat-caves and, having transitioned to cave-dwelling people, then developed populations with a preference for people and people’s houses. The bedbug does provide a living laboratory to study speciation—which is limited to variation within a created kind—but it does not provide a laboratory to show how new, more complex forms of living things evolve as Darwin poetically and imaginatively asserted. About 90% of the bedbugs infesting homes today are resistant to pyrethroid insecticides. However, any reports of rapidly “evolving resistance” are poorly worded. Bedbugs remain bedbugs. They don’t evolve into anything. Those genetically equipped to survive the assault of pesticides have restored their populations with pesticide resistant offspring. This is an example of natural selection (and possibly other mechanisms), as pesticide-resistant individuals selectively survive to breed another day. 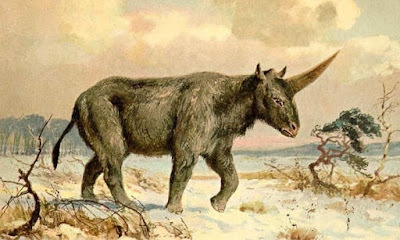 But why is this not evolution, then? There is nothing in this research either reminiscent or predictive of the evolution of increasingly complex “new forms” either wonderful or dreadful. Instead, what this research demonstrates is that bedbugs are still bedbugs, varying within their created kind to survive and thrive in a sin-cursed world. Hold on! She just described how the human variety has evolved resistance to pesticides, so what gives? Note that the scientific jargon is that development is how an organism changes in its lifetime, while evolution is how the population changes over the generations. Pesticide resistance is not something that an individual bedbug first doesn't have, then experiences pesticide, and the develops resistance. No, either an individual has it from birth through genetics or not, just as Mitchell so eloquently describes the process. So pesticide resistance is exactly a new feature, an increase in information about the environment = an increase in complexity, through evolution by natural selection. I can only conclude that Mitchell both understands evolution and believes that it occurs. But as we infer from Genesis 1 and observe in biology, living things—including bedbugs—only reproduce and vary within their created kinds. Bedbug research actually affirms this scriptural truth rather than lending any support to the bacteria-to-bedbug fallacies of Darwinian evolution. The September issue of Scientific American is about human evolution. It includes articles by Frans de Waal, Gary Stix, John Hawks, and others. And this one by Ian Tattersall, paleoanthropologist at the American Museum of Natural History. His research is on hominins and lemurs. A new theory credits a combination of cultural advances and unpredictable climate change for the exceptionally fast rate of evolution in early humans. Climate change repeatedly led to fragmentation of hominin populations, creating small groups in which genetic and cultural novelties were rapidly cemented, accelerating speciation. Our own species, the anatomically distinctive Homo sapiens, was born out of such an event in Africa around 200,000 years ago. About 100,000 years later an African isolate of our species acquired the ability to use symbols. It was almost certainly this unique symbolic cognition that made it possible to eliminate all hominin competition in little time. But this sort of refinement, one generation at a time, would not have been fast enough to radically reshape the human line in seven million years. Why not? This is an assertion that Tattersall makes without any given justification. It may be so, but I don't think anyone can know this. 7 million years is maybe about 350,000 generations. That's an awful lot. If you start out with a brain that weighs just 40 grams and increase its size by one thousandth of a percent per generation for 350,000 generations, you would end up with a brain the size of humans (1,324 grams). I am not saying this is how it happened, as the fossil data suggest a doubling in between 1 million years ago and 200,000 years ago, for example. Just saying that small modifications can lead to big changes on long time-scales. The more we learn about these climatic oscillations, the more we realize just how unstable the ancient environments of our ancestors must have been. Cores drilled in the ice caps and in seafloor muds reveal that the swings between warmer and dramatically colder conditions became increasingly pronounced after about 1.4 million years ago. The result was that in any one location, resident hominin populations would have needed to react frequently to abruptly changing conditions. Then there is this picture. 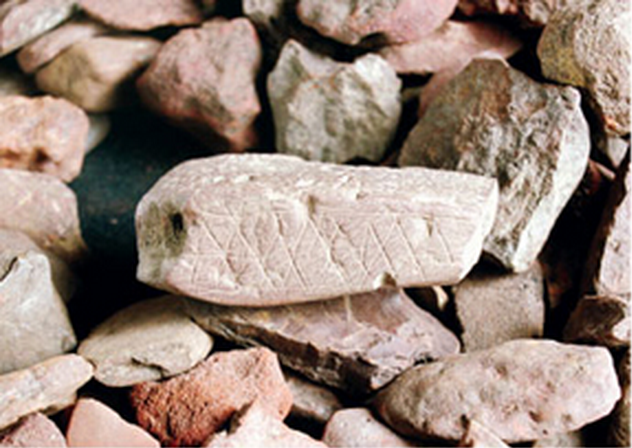 This is a stone with engravings dated to 77,000 years ago. What kind of encoding are we talking about? In kindergarten I doodled something much akin to this - regular parallel and crossing lines. I wasn't conveying any information. And yet this symbolic encoding is exactly what Tattersall proposes is the one thing that gave our lineage an edge over other hominins. When the dust settled, we stood alone, the serendipitous beneficiaries of cognitive advances, cultural innovation and climate changes that allowed us to eliminate or outlast all hominin competition throughout the Old World in an astonishingly short time. Our competitive edge was almost certainly conferred by our acquisition of our unique mode of symbolic thought, which allows us to scheme and plan in unprecedented ways. Interestingly, this development seems to have occurred within the tenure of our species H. sapiens, evidently spurred by a cultural stimulus, quite plausibly the invention of language, which is the ultimate symbolic activity. It's not that I don't believe symbolic thought played a role. It's that I don't believe there is enough evidence that this is the case. Almost certainly this is pure speculation, and we cannot be even close to certain that what eliminated all hominin competition was ability to scheme and plan. Another hypothesis is that they were unable to cope with climate change. Evidently, then, we have to look away from processes occurring within individual lineages to explain the rapid change among Ice Age hominins. Yet the same elements implicated in the gene-culture coevolution story—environmental pressures and material culture—may still have been in play. They simply operated rather differently from how the traditional portrayal suggests. To understand how these factors may have interacted to trigger evolutionary change, we must first recognize that a population needs to be small if it is to incorporate any substantial innovation, genetic or cultural. Large, dense populations simply have too much genetic inertia to be nudged consistently in any direction. Small, isolated populations, on the other hand, routinely differentiate. No. Just no. Populations do not need to be small to incorporate new genetic or cultural changes. Genetic inertia (= genetic homeostasis) is the maintenance of genetic variability within a population. But we know that even though random changes have a small effect on large populations, smaller changes in fitness can be discerned by the selective agents (the environmental causes of selection) in large populations. 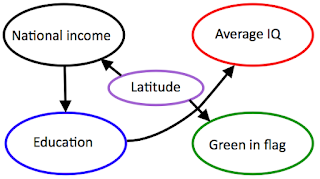 Genetic drift can indeed nudge a small population in one direction or other, but that direction is then random with respect to what is adaptive. Rather, in large populations trait changes that are adaptive (conferring a benefit in terms of survival and reproductive success) can actually become established in a large population. For example, the current human population is very large, and there is no problem sharing and establishing drastic cultural changes. On top of that, when the population is large there is more genetic (or cultural) variation, as there is a constant (average) supply of mutations (or inventions) per individual. The more people there are the higher the chance is that someone will have a mutation for increased brain-size or that someone will invent something new and useful for survival. And even though those changes will take longer to propagate and establish in large population, the chance that they will be lost is also larger in a small population. 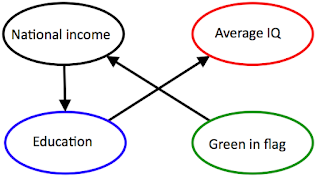 This is basic population genetics theory. Tattersall's essay ends with this intriguing paragraph. Seeing our amazing species as an evolutionary accident, though, contains a profound lesson. For if we were not shaped by evolution to be something specific—fitted to our environment and tailored to a purpose—then we have free will in a way that other species do not. We can indeed make choices about the ways in which we behave. And this means, of course, that we must accept responsibility for those choices. Free will, all of a sudden?! Then if we were shaped by evolution to be something specific, then we would not have free will, like other species? All other species do not have free will because they were shaped by evolution to be something specific? And because we are able to make choices, then we must take responsibility for them? How does that follow? Look, it's not that I disagree that we should take care of the planet, but I would like to make an appeal for a modicum of scientific rigor here. Rigorously, this last paragraph doesn't hold water, and evolution almost certainly does not have anything to say about free will. 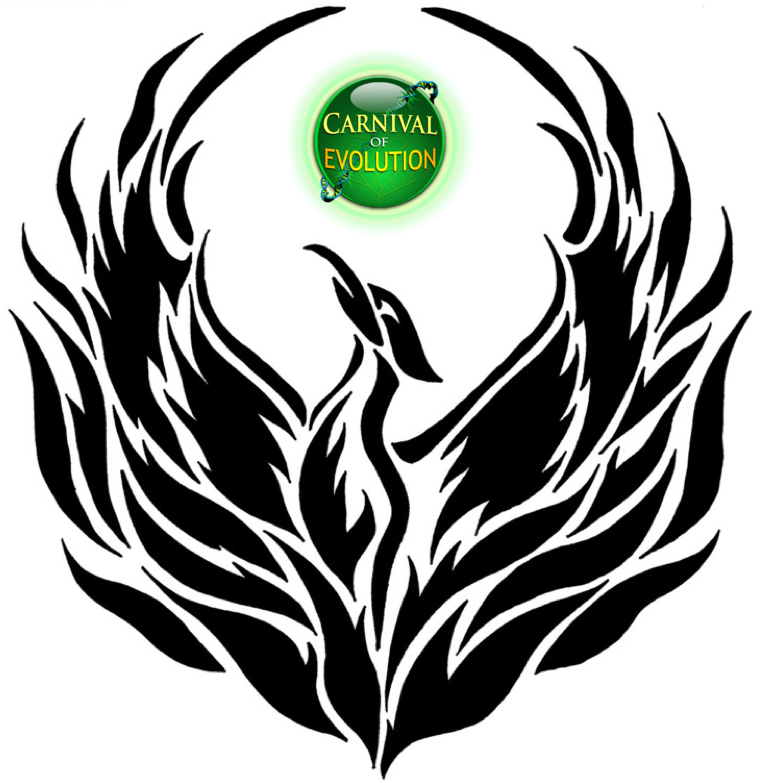 Carnival of Evolution #77 - the Phoenix edition is up at Carnival of Evolution. Where it is going to stay. It is also going to be up every month on the 1st. You can submit blog-posts about evolution as comments on the blog, Facebook, Twitter, or by email. There's a creationist conference coming to Michigan State University this Saturday, so I and others have been thinking and talking about how to respond. The majority think that complete silence on the part of MSU scientists (faculty and students alike) is the way to go, but I think responding is a good idea, and am not really afraid of bad press or short-term effects. To me what matters is what happens in society in the long run - and I think that is really the only thing that matters: some event may cause a surge in some measure of creationism, but if the event causes a decrease in creationism over a span of many years, then all is well, yes? Besides this event and others like them, what can really change the tides of creationism in the USA? We might recall what the origin of creationism is (and I know many will at this point already be put off). It is of course religion. And it is only religion. It is not all religion, as there are many scientists that believe (on evidence) that evolution is the best way to describe our origins, but it is only religion. So, I submit that the problem is not that we don't know what to do about the problem of creationism in America, but it is that no one wants to touch it with a ten-foot pole.